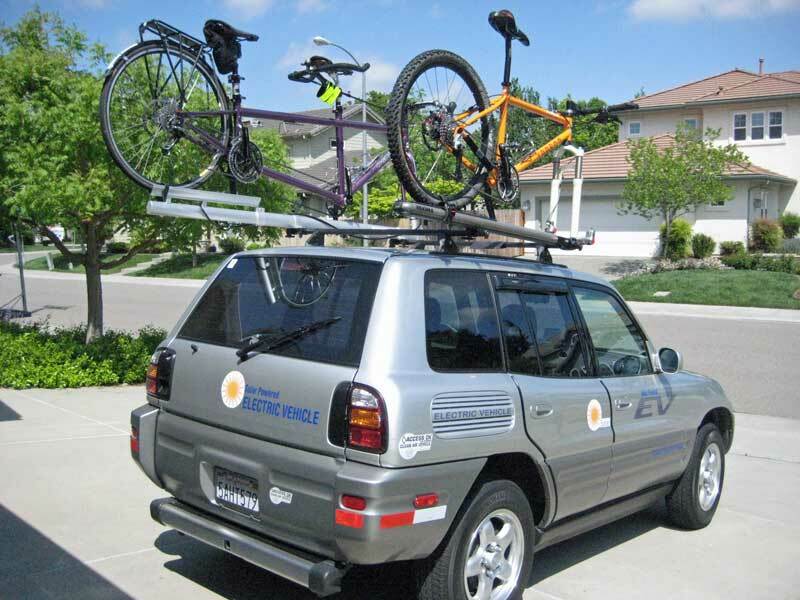 The factory Rav4 Roof Racks (Toyota PN: PTT444-42000) are a great bargain and work well for carrying the stuff that won't fit inside The only shortcoming is that the anchors are loose pieces that can easily be lost, and the rack spread is marginal. But hey, they look great and are relatively cheap and functional, so there isn't much to complain about! 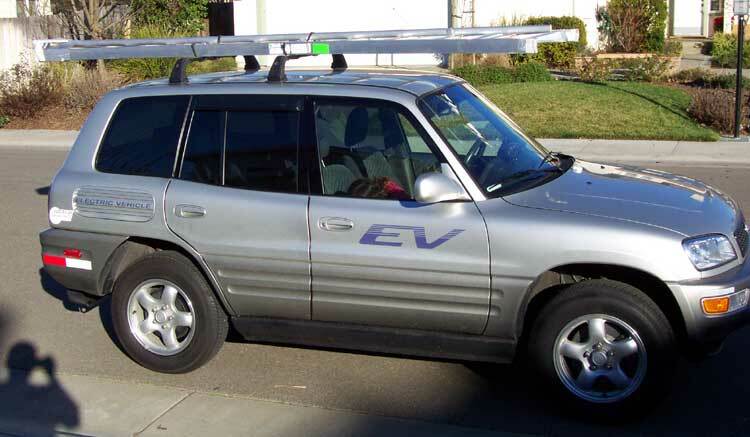 I eventually sold the factory racks (no longer available!) and installed Yakima Tracks to my roof. 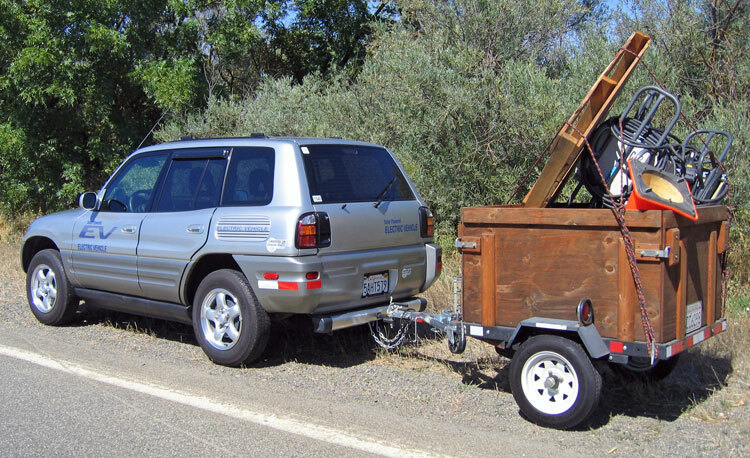 Then I built a utility trailer, then built and assembled a Sportsrig trailer. 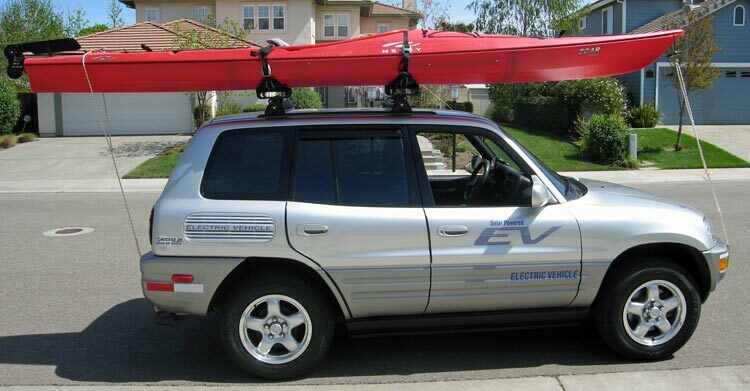 Here is what an 11' orchard ladder looks like on the Rav. 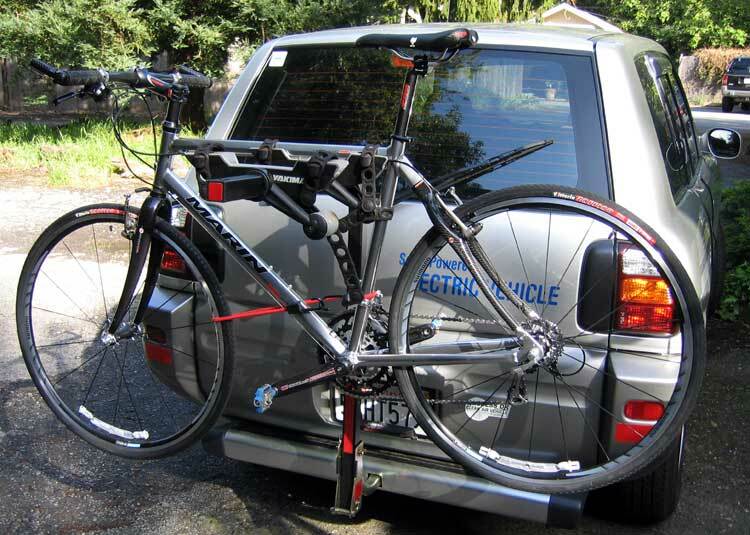 Bringing my new Marin Hwy One bicycle home (same bike rack originally used to host my plug). 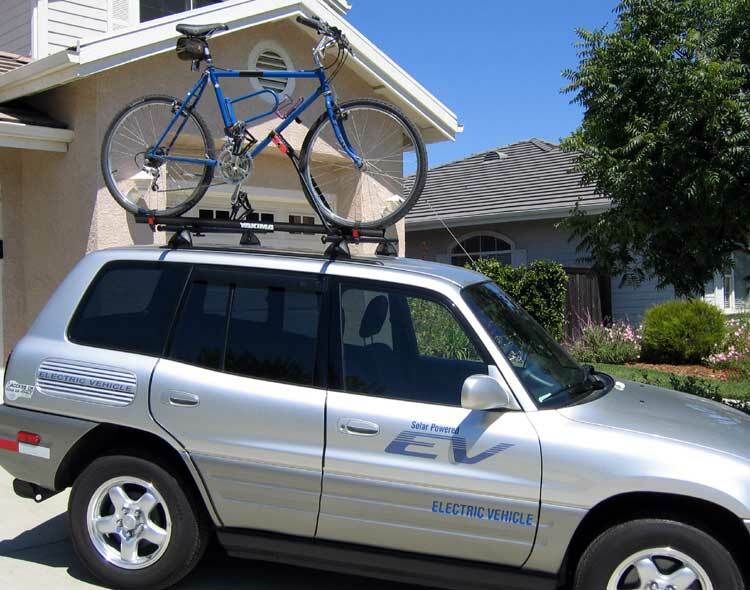 Carrying my old bike on the roof with the new roof rack. 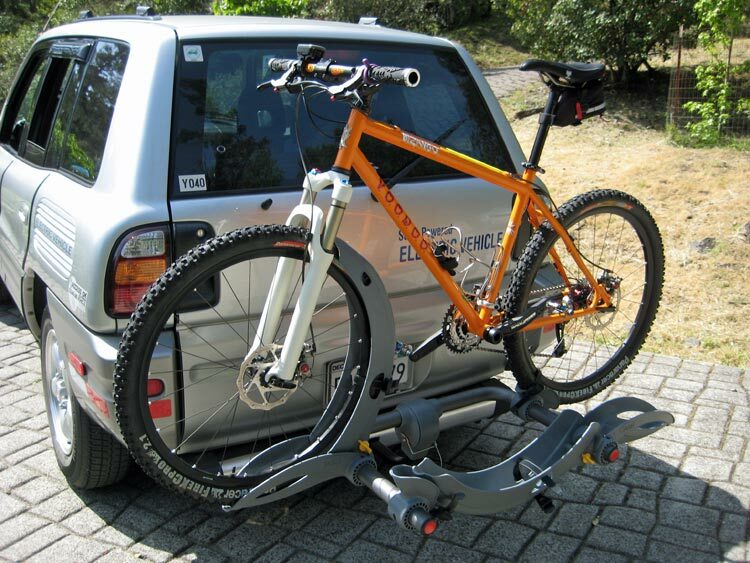 Yet another Yakima bike carrier, with yet another new bike - my custom-built Voodoo hard-tail. 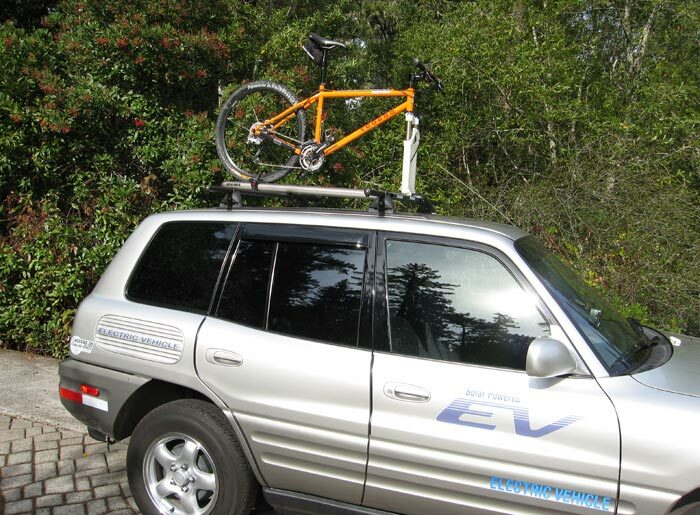 Now a Saris hitch-mount rack (Thelma) with the Voodoo. My little utility trailer. See more details here. 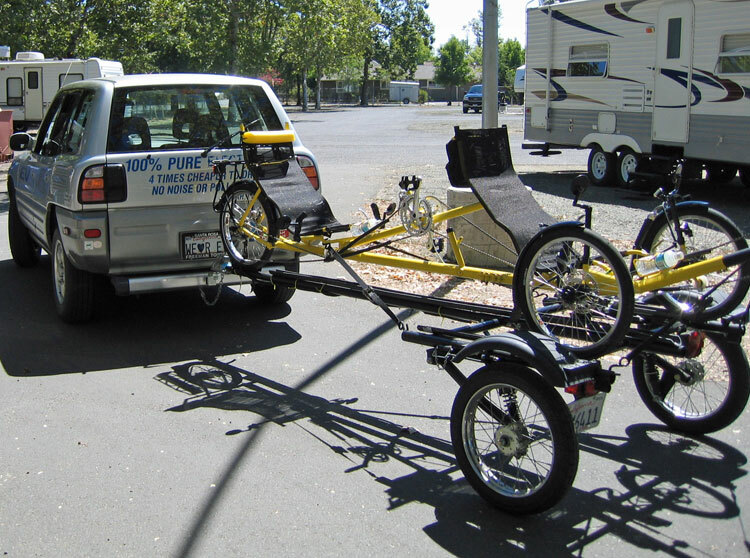 Rob and Milli Stelling pull their recumbent tandem on a custom trailer behind their EUV. Greg Simon using his EUV to haul home the Christmas spirit. 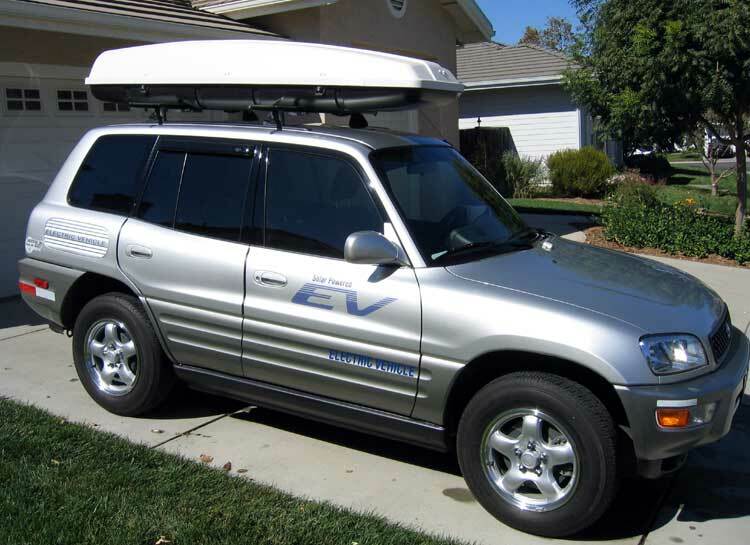 In full EUV mode with Yakima Rocket Box (this can't be done with the factory racks). 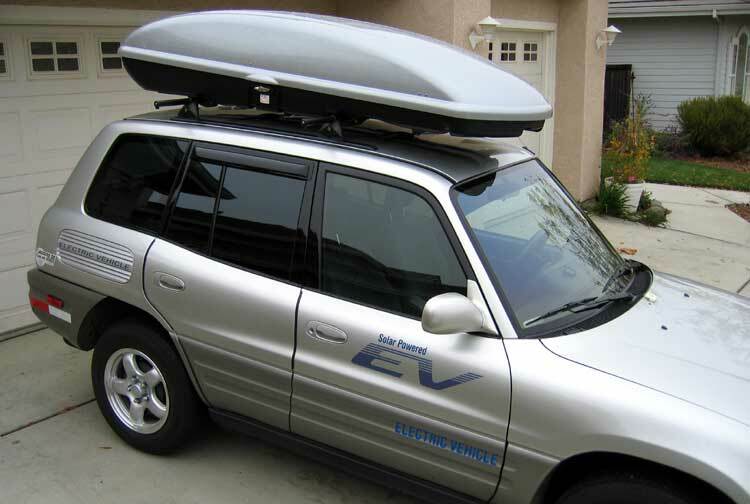 And in full EUV mode with a Platinum Pro 18 Yakima cargo box. Hauling a load of used chargers and pallets to the EAA North Davis Storage Facility. Shiny new Kayak! 14" Necky Zoar Sport. Longest one that'll fit in my garage. Carrying Kyra's new (7th BD) bike and the Purple Tandem. 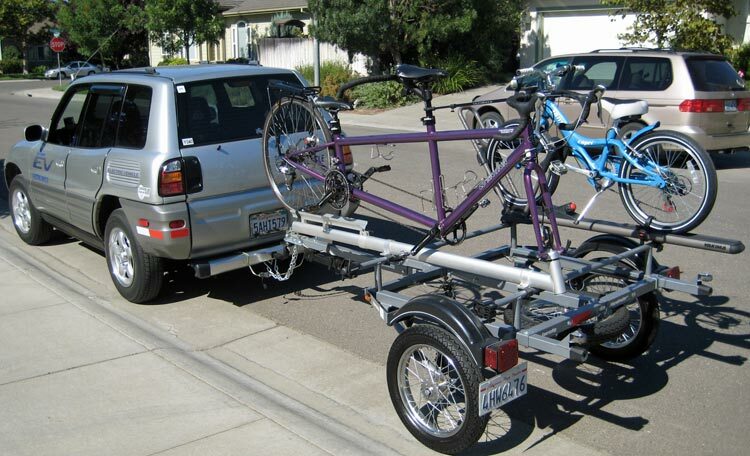 Tandem on top and two road bikes off the back. 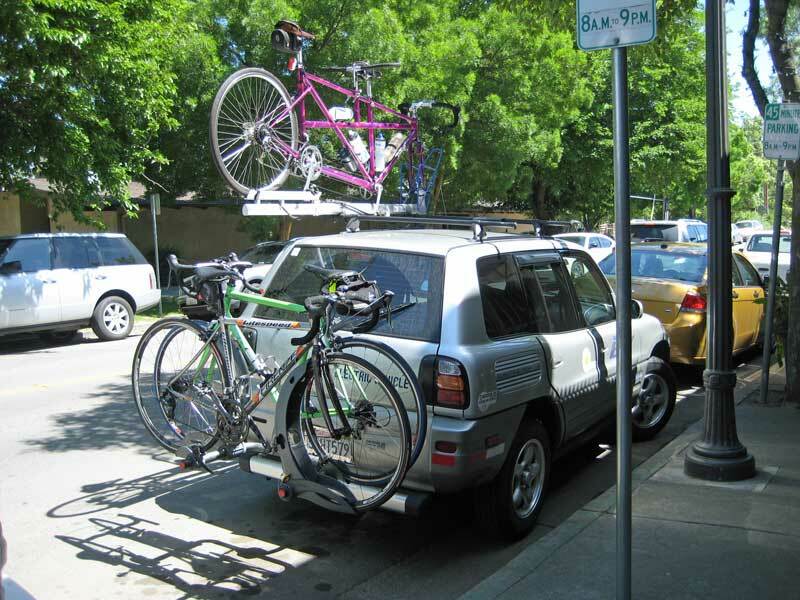 Tandem and mtn bike on the roof. Something you don't see every day. 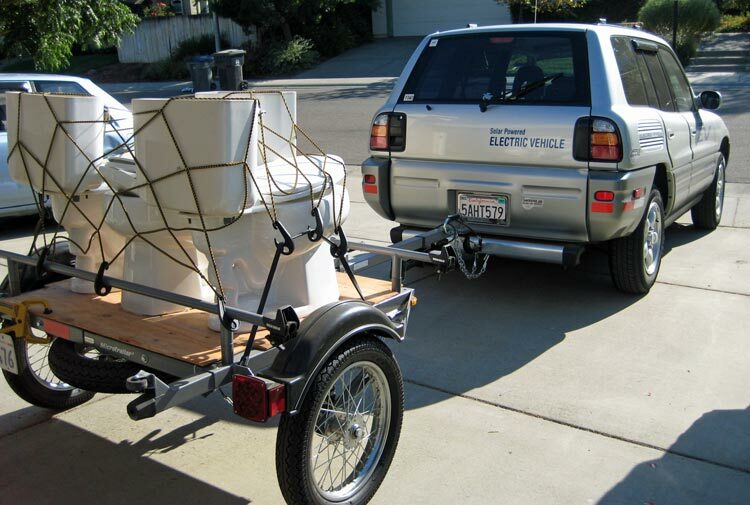 Three toilets headed to the dump (the neighbors wouldn't let me use them as planters in the front yard). 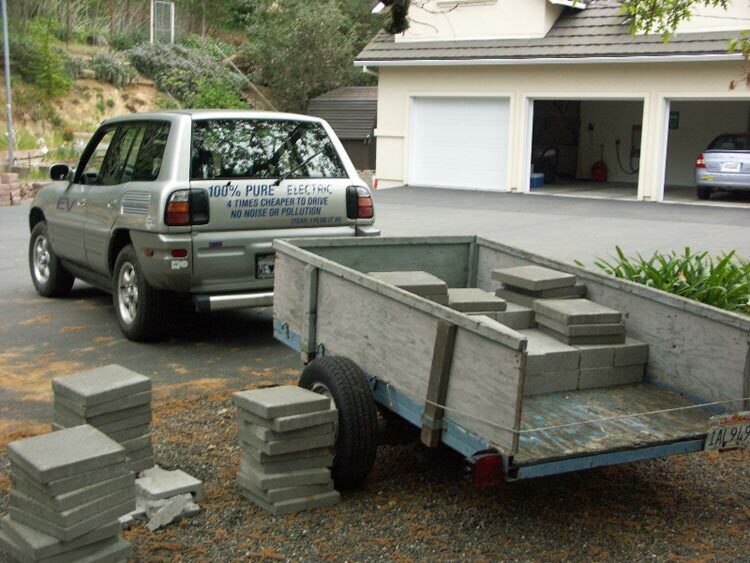 At Rob's house after towing his 800-lb trailer filled with over 1000-lb of concret blocks up the 1000' of elevation gain to get to his house.